Barbara Fant | The tongue is powerful… Speak Life! Take a moment to tour Barbara Fant’s wordpress page. 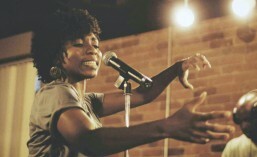 Barbara is a master performance poet, workshop presenter, and artist facilitator. Click on the various categories in the right-hand side navigation which includes video, photo, and biographical details. In the meantime, enjoy the introductory poem written below by Ms. Fant. Blessings to you! Just wanted to hear God louder than the dragon in my own throat, head, it’s legs crawl, stampede through brain as if this is war! This is war! I be warrior! Said, what spirit discipled your tongue before it ran off manifesting death in your name? Said, what spirit is releasing your tongue?